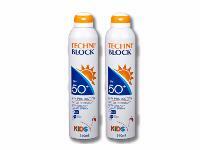 Techniblock SPF 50 Wet & Dry is the best sunscreen for water enthusiasts, whether you're in the water or on the water. Save £6 when you buy this twin-pack. This unique sun protection spray can be applied to both wet and dry skin, providing robust and enduring protection. Dermatologically approved and designed specifically for harsh environments, such as sailing, power boating and canoeing, Techniblock SPF 50 Wet & Dry 200ml is a non-greasy, non-sticky, very water resistant sun protection aerosol spray with real staying power. Recommended by the RYA (Royal Yachting Association), Techniblock is the first choice for boaters. Ideally suited for children too, especially when they are in and out of the water. You can top up your little ones without having to dry them off or even while they are sat in the paddling pool. Fuss-free and easy to apply, the best sunscreen is one that children don't mind wearing, doesn't need rubbing in and that sand won't stick to! The unique Wet & Dry formula from Techniblock has all the same, great Techniblock qualities within it's formula, but is also suitable to apply to wet skin, so it's ideal for topping up your sun protection when you've just got out of the water or are enjoying water sports such as sailing, windsurfing and paddle boarding. Fragrance-free and breathable, this sunscreen will not block pores or irritate even the most sensitive skin, significantly reducing or even eradicating the symptoms of skin rash and prickly heat. It contains anti-oxidants to enhance the skin's natural defences in the fight against the damaging effects of UV exposure. Very long lasting, it provides high protection in a single application, which can last all day without the need to re-apply, providing great value for money. All the Techniblock sunscreens are extremely comfortable and clean to wear, do not need rubbing in and are non-greasy and non-sticky on the skin so sand won't stick and cause irritation. 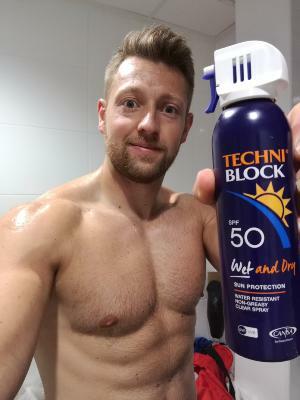 Unlike traditional sun lotions and sun creams, Techniblock does not contain oils or emulsifiers so it will not block pores or break down in water, making it extremely waterproof. Techniblock has no use-by date because it is packaged in a sealed and pressurised airtight container, so the formula is not compromised after opening, meaning no waste and no risk of spillage in the bottom of your beach bag! Developed and manufactured to the highest standards by Technikon Pharmaceutical Laboratories in South Africa, Techniblock provides 5* broad spectrum (UVA/UVB) protection and is fully compliant with European regulations for sunscreens. The Techniblock Sunscreen range is endorsed by CANSA (Cancer Association of South Africa) as a preventative measure against skin cancer.and is available in SPF 30, SPF 40, SPF 50+ (SPF rating between 56 and 61) and a Children's SPF 50+. As a family of water addicts we are no strangers to world travel and hot climates. We have used sun screens in California, Brazil, Sri-Lanka, Hong Kong and in many other locations. My whole family agree thatTechniblockproducts are the best we have ever used. One of our 8 year old twin girls has a Sun allergy and has had to previously use steroid creams after being in the sun. However, ever since we started using Techniblock (SPF50 Wet & Dry) she has never had the problem. As a family we are pleased to endorse the Techniblock range.